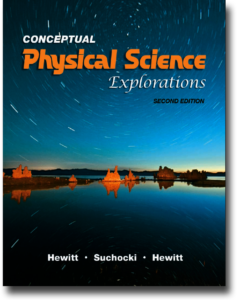 Our “college-level” conceptual textbooks help the student build a strong foundation in the basic concepts of science, which are presented in the context of our daily lives. Because of this orientation, our books have become popular among high schools. Given this popularity, our publisher, Pearson Education, asked us to create textbooks appropriate to the junior high school level, grades 7 – 9. This resulted in our two “Explorations” titles, one in physical science and the other in integrated science. We are very proud of these two titles: Conceptual Physical Science Explorations and Conceptual Integrated Science Explorations. 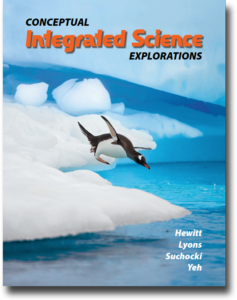 You can be confident that our “Explorations” science courses based upon these titles are both enjoyable and widely recognized as the foundation of any accredited jr. high school level science curriculum. The goals of each of these courses are to provide a broad introduction to the basic concepts of science as well as to keep the student turned on to the joys of learning science. After completing either one of these courses, the student will be set to focus on the individual areas of science in high school. For this we recommend physics first, followed by chemistry, and then biology. Why? Because biology is the chemistry of life. Chemistry is the physics of the atom. And physics is a study of the fundamental rules of nature. To learn more about each textbook, please click on a cover shown below to find the table of contents and our teaching philosophies. To learn more about our self-study courses, review the course descriptions accessible through the side bar menu. Click on the side bar video to see a music video montage of us in action. This montage is a collection of snippets from our growing library of fun, engaging, and family friendly video lessons (500+), which like the textbook, are an integral component of each of our self study courses. Click on a textbook to learn more about its contents. Music Video Montage: The Works!